We all live our life inside of a box. The box for some people is really small, and for other people, it is really big. For me, it was clear what this statement had meant. But it was hard to explain. A simple statement with so many complex meanings. Becoming soft had meant that I had started to become too comfortable. Or rather, my tolerance for being uncomfortable was becoming narrow. I was starting to become too complacent. My body was becoming soft. My mind was becoming soft. I was not bothering to remember things. My meditation practice was at a stand still. I was not exercising. I started to notice that I was not working out so much. I was getting lazy and not doing my yoga practice. Everything was getting too hard. And when I did exercise, I would give up as soon as it became too difficult. My desire for comfort and pleasure was taking over. And when anything became uncomfortable, I was always adjusting away from discomfort to something more pleasant. Around this time, I was about to lead a group to India. 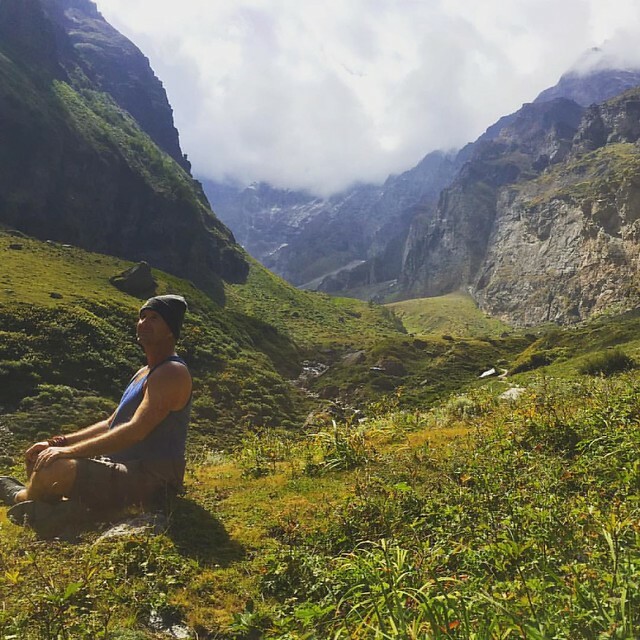 On this journey to India, the trip was going to end with a hike to the Valley Of Flowers. We were going to make a climb to an elevation of 12,500 feet. The trek was 14 km. Due to some health issues, I had gained a lot of weight. My knee was giving me issues – painful issues. My energy was at an all-time low, partly due to the health issues I was dealing with. There was an option to take a helicopter. Honestly, I was on the fence about taking the helicopter up until the last moment. But, I decided to hike up the mountain. I decided to make the climb up that mountain. Because in my heart I knew if I did not defeat that mountain, other mountains in my life would overwhelm me. And so I did it! I climbed that beast of a mountain. The journey to the Valley Of Flowers is magical, arduous, difficult, overwhelming, and transforming. And during the climb up the mountain, many pilgrims along the way will greet you. Some of these pilgrims are men and women who are in the sixties, seventies, and even eighties. They this climb with only the simple sandals. And sometimes even making the climb barefoot. Climbing to the Valley of Flowers brought back a flood of memories of moments in my twenties when I was an avid hiker. There was something about hiking that connected me to my inner power and feelings of having an indomitable will. In the past, making challenging hikes has connected me to an inner feeling of power that was able to conquer all hills in my life. And watching these older people make this climb in their bare feet is a confronting reminder of where our true power resides. A power of indomitable will to do, to act, to be and to create! This power of indomitable will resides within us. Before leaving for India, I came to realize I was living in a box of complacency that was turning to self-doubt.My personality was starting to take on the shape of someone who was weak and unable. The box I was living in was beginning to reshape my world view, and in it, I was filling my life with “I can’t”. We all have the power to climb any mountain. We all have the power to do anything and accomplish anything. We all have the power to overcome any obstacle. But we stop ourselves short all the time. We live in the box of our own creation and design. Surrounding this box are the stories we tell ourselves. These stories fortify and strengthen the 6 walls of this box. Most of us do not know that this box is even there. We don’t know what we don’t know. So one of the first steps on the path of yoga is to accept that there is a lot you don’t know about yourself. In fact, there is little that you know or understand about yourself. Next, accept that you are a genius when it comes to creating stories about yourself. Stories you create about yourself that are debilitating you and draining your indomitable willpower. I lead the One-Month Immersions at Blue Osa. And without fail, by day 7, 8 or 9, many people show an attitude that says, “I already know everything.” and “There is nothing for me to learn!” If this your attitude, then you will never do anything in your practice. And your yoga practice will only do one thing: give you a swollen ego and make your head even bigger. Many people have a silly idea that just by practicing yoga, the will become spiritual and enlightened. Actually, the reverse happens. If they are egotistical and have big heads, then yoga will only give them a bigger head. Yoga will just make them more arrogant. By design, our ego protects the stories we have about ourselves. The function of our ego is to keep us in the illusion of safety. Our ego, by design, keeps us in our box. Staying in the box is safe. And stepping out of the box is scary! Even the appearance or mere thought of stepping out of the box is really scary. Think about a time you just thought about taking a risk. Didn’t your heart race a little faster? Did you sweat a little more? Stepping out of the box of what you know and are comfortable with is challenging and difficult. And what makes stepping out of the box, even more, difficult, other than the fact that you don’t even know you are in a box, is that you have probably surrounded yourself by people in your life who are very invested in keeping you this box. You know you want to live outside of your box. Once you step outside the box there is a universe of infinite possibilities waiting for you. Only you don’t know how! So here are some steps that I use every day to live outside my box. 1. Ask yourself if what you are about to do makes you afraid or uncomfortable. Anytime we are about to step out of the box, we often become afraid. And the first lesson of the Himalayan masters is to practice living a fearless life. The first lesson these masters give us is to overcome all our fears. As soon as you notice you are afraid of something, step back and look at your fear. Be objective and put your fear into a glass jar. Look at your fears as something outside of you. When we are afraid, we lose objectivity and have an enormous emotional reaction to them. We become a slave to the false reality we created for ourselves. This self-created reality that has false evidence appearing real. Before climbing the mountain to the Valley Of Flowers in India, I had a lot of fear. Fear that I would not make the journey. Fear that my knee would not support me. Fear that the hike would be too hard for me because I had not done anything like that in such a long time. My biggest fear was that I would let my group down and appear weak to them. But there was nothing real about my fears! On another occasion at Blue Osa, I was busy working all day in the office. Around 2:30 pm I decided to go for my daily swim. I went and changed into my shorts and headed to the beach which is about 50 meters away. As I got to the beach, I saw enormous waves about 15 high crashing into our shore. It was a high tide. There was also a huge swell at the time. Immediately, I turned around and walked away. There was no way I was going to swim that day. I then turned back around and went for my swim. With caution, I approached and paid attention to the waves as they rolled in and out. Between the sets, I made my way into the water and had a great swim. Even my dog Shiva came with me. 2. Pay attention to when you or anyone else tells you that you can not do something. So many times we set goals for ourselves, and somewhere in our minds, there is a part of you telling you that you can’t do it. Years ago, after moving to New York, I realized I really wanted to take a trip to Hawaii. But all my life I told myself that “I can’t”! It was too expensive. It was too far. I don’t know anyone there. What if I run out of money? Whenever you catch yourself telling saying “I can’t”, pay attention! Then ask yourself why you are telling yourself that “I can’t!” Which fear is feeding that story? 3. Do something at least once a week that you would not typically do. So many of us get into our habit patterns and we never see life different. The physical practice of yoga helps us to see ourselves in a different way. 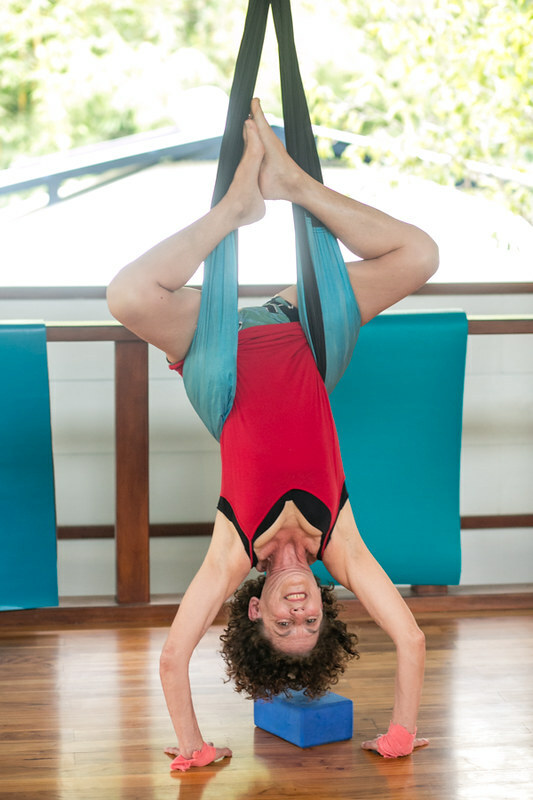 Expressing the postures differently helps us to see life differently. Then our viewpoint of our life changes. Make a conscious decision to do something different every week. Do something that you would never normally do. This will help you to keep a fresh perspective on your life. When you have a fresh perspective of life, the walls of your self-imposed box become clear to you. And you now have a choice to live your life outside of this box. 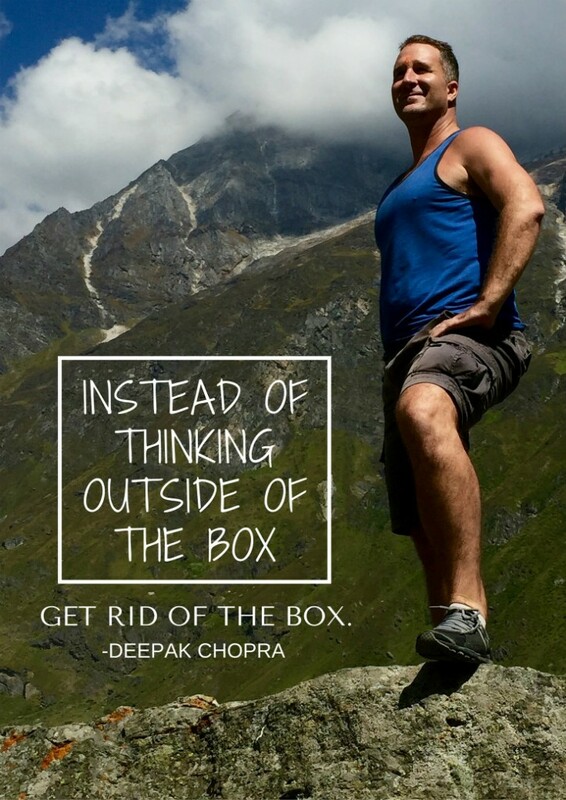 Living outside the box invites freedom, fresh perspectives, new adventures, and more, a possibility to achieve the highest run on the ladder of life. Enlightenment and the pursuit of happiness are your birthrights. Happiness is the purpose of life. But happiness will never be found in your self-imposed box. So take a risk. Step out of your comfort zone. Pay attention when you start listening to the opinions and judgments of others. Tune them out, and begin doing things in your life that you never would typically do. Live your life outside of the box. Learn more about Yogi Aaron’s journey in his recently published autobiography!